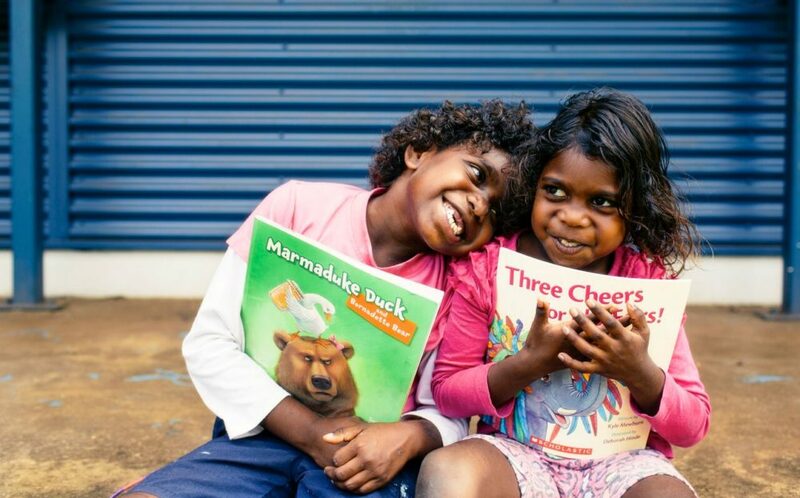 Jeanette has created an alphabet with a difference to raise literacy standards and encourage conversations about language, culture, emotions in Australia’s remote and marginalised communities. What do you get when you take two creatives who are passionate about literacy and education and combine their skill sets with an underlying driver to help make a difference? 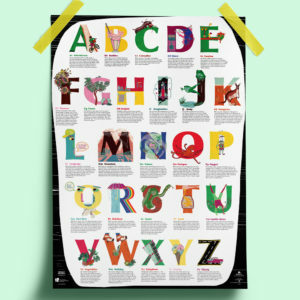 You get the ‘Alphabet, with a Difference’ poster – a collaboration between Perth-based copywriter/editor, Jeanette Muscat and Brisbane-based illustrator/graphic designer, Celeste Fishburn to support The Australian Literacy and Numeracy Foundation (ALNF). I’ve been a fan of the ALNF’s work for years, so was already thinking about doing a project to support them. As a writer, word-nerd, wordsmith type, I cannot imagine not having literacy or tools with which to communicate, so the alignment with ALNF’s values was a natural fit. I had what I thought was a ‘half-baked idea’ and started talking to Celeste about it. Fortunately, she thought it was a pretty well-baked idea and was keen to help make it happen. When we realised we were both as passionate about literacy and education as each other, everything aligned and it just made sense. We got brainstorming, working closely with the ALNF to ensure they were on board with the idea, the words we chose – the lot. They have been incredibly supportive, which has been so important to us to have their endorsement of each decision we’ve made. As well as trying to ‘make a difference’ (via the fundraising component), we wanted the poster to be a little bit different from your average alphabet poster, while still being informative and not too difficult, and therefore, potentially alienating, which would defeat our whole purpose. So rather than the standard ‘A is for apple, B is for ball’ approach, the poster deliberately includes diverse words and caters for all learning levels – and ages. The descriptions are also deliberately different – to evoke questions and discussion. For example, through the accompanying wording, we introduced conversations about language, culture, emotions – things we want kids to think about and talk about from an early age, as well as the more lighthearted stuff. We talk about being helpful and looking out for others, being adventurous, asking questions and using your imagination. We mention Aboriginal culture and Dreaming stories, we mention animals and nature because we know some of these posters will be going to people in remote and marginalised communities. And while we wanted to include content that is meaningful to all Australians, we especially wanted it to resonate with kids and families in regional and remote communities and migrant families, who might be learning about Australian language and culture for the first time. Likewise, we wanted the illustrations to amplify these conversations while using imagery that resonated with a diverse audience. We chose to support ALNF because its tagline, ‘literacy is freedom’, truly resonated with us. The thought of not being able to read or write, and the challenges you face without having those skills as a fundamental part of day-to-day life is overwhelming. As English-speakers, we might sometimes experience the ‘privilege’ of struggling to communicate if we’re in a non-English-speaking country on holidays, but not in day-to-day life. 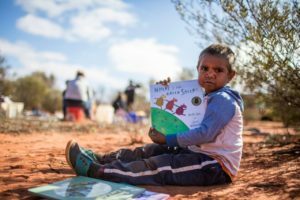 Dedicated to raising language, literacy and numeracy standards in Australia, ALNF’s programs address a wide range of learning needs, with a particular focus on Indigenous, refugee and marginalised communities. ALNF’s programs include First Language Literacy, Refugee Action Support (RAS) program, Community Action Support (CAS) program and Early Language & Literacy, as well as providing resources to through its Literacy Pack and Share-A-Book programs. Working on this project has not only given me pure creative joy, but knowing that in some small way we are helping ALNF continue to reach people in remote and marginalised communities to improve literacy enhances that experience. The impact is two-fold. While our poster itself helps people to learn and encourages conversations between kids and their parents or guardians, kids and their teachers, kids and their friends, the money raised also helps ALNF provide their services to marginalised communities.  But it’s not just about the product or the donation; it’s knowing that we’ve contributed to making tangible differences in people’s lives – and that’s huge! It’s not only different – but we hope it’ll help make a difference. Jeanette Muscat is a Perth-based copywriter, editor, print and digital publisher, and self-confessed word-nerd. She works with clients – and other collaborators – to create content, print or digital products that help them better communicate with their clients.